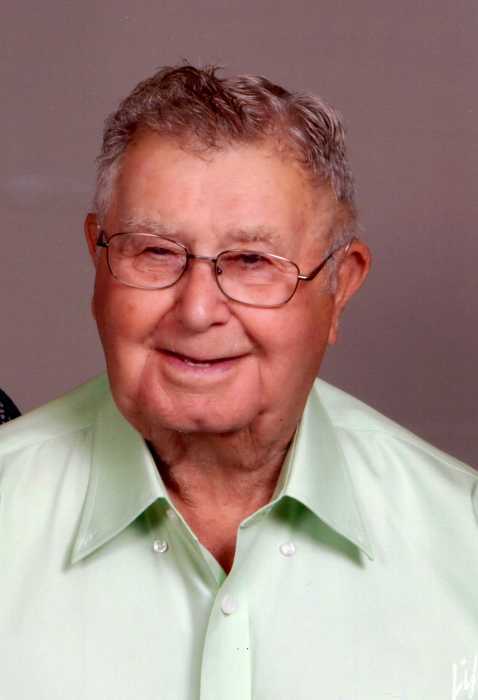 SYLVESTER WILLIAM VORTHERMS, age 92, of Wilmont, died Saturday, September 1, 2018, at the Worthington Sanford Sunset Hospice Cottage. He was born January 13, 1926, in Granville, IA, to Frank and Regina (Beckmann) Vortherms. Sylvester attended St. Joseph Catholic School in Granville. He served his country in the United States Army. Sylvester married Ellen Jungers on February 17, 1955, in Hospers, IA. The couple farmed near Wilmont for many years. Following his farming years he worked at SW Minnesota Opportunity Counsel and Greenview Rest Stop. He was a member of Our Lady of Good Counsel Catholic Church in Wilmont. He enjoyed gardening and cards. The grandchildren and great-grandchildren were the highlight of his life. Sylvester is survived by his wife, Ellen Vortherms, Wilmont; seven children, Patricia (Jim) Pospisil, Alexandria; Dale (Dee Rae) Vortherms, Spirit Lake, IA; Julie (Mark) Weber, St. Francis; Kenneth (Tammy) Vortherms, St. Peters, MO; Mark (Jane) Vortherms, Avon; Keith (Lisa) Vortherms, St. Louis Park; and Carol (Dan) Hystad, LeMars, IA; sixteen grandchildren; Jason (Katie) Pospisil, Amber Pospisil, Shawna (Scott) Wilde, Andrew (Kit) Vortherms, Grant (Kari) Weber, Aleithia Weber, Seth Weber, Taylor Vortherms, Conor Vortherms, Nathan Vortherms, Christopher (Meagan) Vortherms, Caitlin Vortherms, Rachel Vortherms, Mitchell Vortherms, Danielle Hystad and Matthew Hystad; four great-grandchildren, Hunter, Adison, Taylor and Presley; three on the way; and a brother, Leo (Agnes) Vortherms, Westbrook. He was preceded in death by his parents Frank, Regina and step-mother Anna Vortherms; siblings Evelyn, Isabella, Arnold, Ernest, George and Johanna. Visitation will be from 4-7 pm Thursday at Our Lady of Good Counsel Catholic Church, in Wilmont, with parish prayers at 4 pm. Visitation also one hour prior to the service at the church on Friday. Funeral Mass will be Friday at 10:30 am at Our Lady of Good Counsel Catholic Church, in Wilmont, officiated by Monsignor Richard Colletti. Burial with full military honors provided by the Wilmont VFW will be in the Calvary Cemetery in Wilmont. Please make donations to the Sunset Hospice Cottages or Our Lady of Good Counsel Church.